Building on prior areas of development we continue to inspire a deep love of Learning. Our Pre-K3 curriculum continues to expand language development, social-emotional skills, self-confidence and independence and we introduce science, math and social studies in a fun, positive atmosphere. 90%of a child’s brain is developed by age 5. Rich, stimulating experiences and interactions support brain-cell connections. We know our children learn best when they are exploring the world around them. 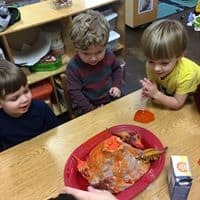 Our preschool program engages your child’s natural curiosity with fun, stimulating activities that foster healthy cognitive, social-emotional, and physical development. Our teachers plan activities throughout the day to expand your child’s language development and pre-writing skills. We sing and dance and experiment. Play is the work of all young children. The experiences of children 3 to 4 years old shape the attitudes, aptitudes, and achievements for years to come. Our Pre-K3 students are in their peak years of acquiring new skills and knowledge. 90% of a child’s brain develops by the age of five. 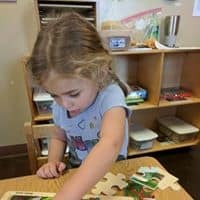 An effective preschool learning program offers both short-term and long-term cognitive, social, and emotional benefits for your child, such as better preparation for and performance in school, higher educational achievement, and even a lower chance of delinquency and crime in childhood and adulthood. Our preschool program lays the foundation for success in learning and life. 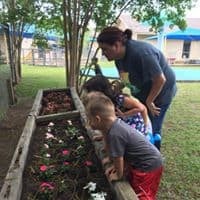 Cognitive: Stimulating activities in a secure, well-structured environment with nurturing teachers promotes essential brain-cell connections. Healthy children are born with 100 billion brain cells, each capable of making as many as 20,000 connections. 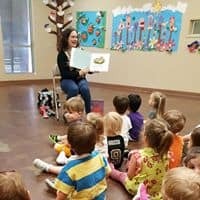 Unfortunately, cells that don’t connect die and are never replaced.Our teachers create a brain-friendly environment for your child every day. Social-Emotional: As children grow, they form many relationships: first with parents, then caregivers/teachers, and finally with their peers. The quality of these early relationships influences how a child learns to manage emotions, interact, and share for the rest of his or her life. Responsiveness and communication is key to social-emotional development. Physical: Your child needs a safe, secure environment to master his or her new physical abilities of constantly climbing, running, hopping, skipping and jumping. Our age-appropriate playground equipment helps further the development of gross and fine motor skills. Social-Emotional: Our students experience collaborative dramatic play, thoughtful communication, and shared movement activities. Conversation: Language is essential to early cognitive development. Children who hear a multitude of words and participate in conversations build more brain-cell connections and are stronger learners for the rest of their lives. In our preschool program, your child enjoys engaging conversations with responsive teachers and peers in comfortable classroom settings. Learning Spanish: Studies show that the first three to four years of a life are the best time for a child to learn a new language. Our skilled teachers introduce Spanish in fun, engaging ways, weaving words into songs, stories, games, and make-believe time. Children are continually exposed to greetings, numbers, food, clothing, animals, and weather vocabulary. Physically Fit: Our little ones love to get “their wiggles out” by stretching, jumping and exercising.